Tag Archives for " New Rules of Marketing and PR "
My good friend David Meerman Scott stopped by the Duct Tape Marketing Podcast recently to talk about the release of the 3rd Edition of his mega best selling book The New Rules of Marketing and PR. This book changed the way many people think about marketing and has remained on many a “must read” list since it was first released. The first edition came out in 2006, right at the edge of the social media explosion, so naturally version two included the addition of social media. So, what’s changed in the last few years enough to warrant a third edition? 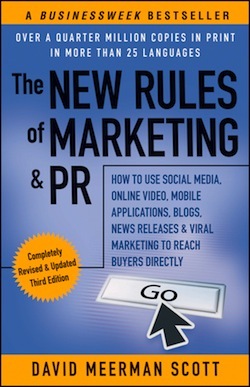 The Third Edition, features completely updated case studies and examples also includes a very useful Marketing and PR Strategy Plan template that will help people get started using a step-by-step approach to social media. In addition there’s a new chapter on social media measurement and ROI tracking. David is staunch promoter of the “The Power of Free.” and that chapter should be required reading for all marketers. The book also includes a discussion on the use of Real-Time tactics made available by the real time nature of news and events reported online. The case studies in this vein are extremely interesting and feature some very creative marketing thinking. The biggest addition to the book, however, is the inclusion of a section on mobile. Mobile is last year’s social and marketer need to understand both the new tools and new behavior that comes with building a business in a world gone increasingly mobile.